Development of the Kansas Underground Salt Museum has reached the point that the Board of Directors has decided to respond to the intensifying interest of people wanting to experience a visit to the exotic subterranean chambers carved from salt deposits formed millions of years ago. 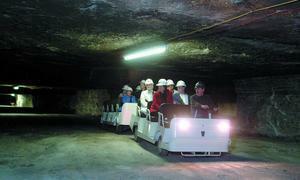 Preview Tours of the salt mine where the Museum is being developed will begin May 1. While construction of the exhibits and infrastructure continue, the public will be taken on a tram and walking tour of the area located 650 feet below ground. "Work continues underground to further develop the museum, and we're also constructing the permanent visitors center above ground," said Linda Schmitt, executive director of the Kansas Underground Salt Museum. "But, we felt it was time for the Preview Tours as it offers the opportunity to see the progress made thus far and to experience the thrill of being 650 feet underground." Entry to the museum involves a trip in a double-decked elevator that accommodates up to 30 people. Once underground, visitors go on The Dark Ride, a tram tour through the mine that highlights eccentric features of the mine, while also offering a glimpse of what it's like working in a mine and having little light available. Following The Dark Ride, visitors can walk through the various museum exhibits at their leisure. At present, the museum features exhibitory highlighting the mining process, geology, mine transportation, the underground vaults and storage business, and includes a gift shop. The mine maintains a 68-degree temperature and 40% relative humidity year-round making it a very pleasant environment. Because some walking is involved, visitors should wear comfortable shoes. The Preview Tours will be offered Tuesday through Saturday starting at 9am, and Sunday from 1pm. The final tour going underground each day is at 3:30 p.m. The museum is not open on Mondays. Visitors should make advance reservations, as museum access is determined by elevator capacity. More information about the salt museum can be found at Undergroundmuseum.org.